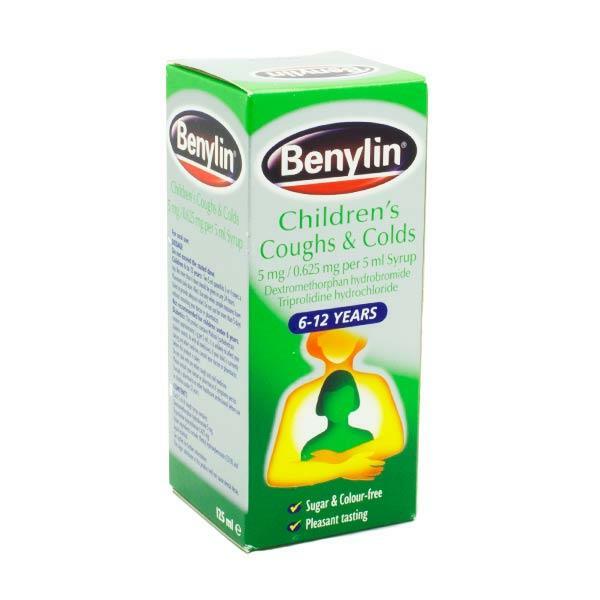 Benylin Children’s Coughs & Cold Syrup helps to relieve dry coughs and colds. The active ingredient dextromethorphan helps to stop persistent coughing. The syrup also contains triprolidine, an antihistamine which helps to stop sneezing, runny nose and watery eyes. This medication is for use in children between the ages of 6 – 12 years. Children 6 - 12 years give 10ml (two 5ml spoonful’s) every 6-8 hours. Do not take more than 4 times daily. Each 5ml of cough syrup contains, Dextromethorphan hydrobromide 5mg, tripolidine hydrochloride. This product is for use in children 6 - 12 years. In the case of older children and adults. This medication should not be used if you are pregnant or breastfeeding unless advised by your doctor. In the case of adults. This medication may cause drowsiness. If affected, do not drive or use machinery.